CD146 is also known as the melanoma cell adhesion molecule (MCAM) or cell surface glycoprotein MUC18, is a 113kDa cell adhesion molecule currently used as a marker for endothelial cell lineage. As a member of the Immunoglobulin superfamily, It is expressed on chicken embryonic spleen and thymus, activated human T cells, endothelial progenitors such as angioblasts and mesenchymal stem cells, and strongly expressed on blood vessel endothelium and smooth muscle. 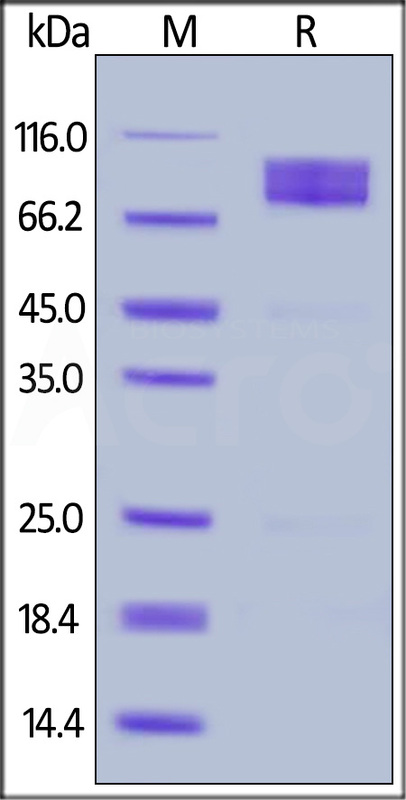 CD146 has been demonstrated to appear on a small subset of T and B lymphocytes in the peripheral blood of healthy individuals. The CD146+ T cells display an immunophenotype consistent with effector memory cells and have a distinct gene profile from the CD146- T cells. As a Ca2+ independent cell adhesion molecule involved in heterophilic cell to cell interactions and a surface receptor,CD146 triggers tyrosine phosphorylation of FYN and PTK2 and subsequently induced signal transduction, proteolysis or immune recognition. Kuske MD, et al.,1999, Cytogenet. Cell Genet. 87 (3-4): 258. Elshal MF, et al., 2005, Blood. 106 (8): 2923¨C4. Elshal MF, et al., 2007, BMC Immunol. 8: 29. Covas DT, et al., 2008, Exp. Hematol. 36 (5): 642¨C54. Russell KC, et al., 2010, Stem Cells 28 (4): 788¨C98.